This Happened In My Lifetime? I rarely go to violent movies – I hate to watch gratuitous action with blood and guts. It makes my stomach hurt to see it on screen in front of me. I prefer my entertainment to be to be entertaining, not physically debilitating, thank you very much. So watching Selma felt like a punch in the gut for me. It was painful. It was difficult. It was amazing. My emotions were close to the surface going into the movie. I lived through that period of history. I was only 5 years old and relatively unaware, but I remember the news broadcasts. I remember the conversations. I remember being shocked by what I heard. How was it that some humans could be so awful to others? I didn’t understand it. And I grew up with plenty of violent images on the news – from Vietnam, from the Kennedy Assassination – very little filtering or concern about how the graphic nature of the news would affect children. It’s probably why I made it a policy with my own kids to turn off the news – it scarred me when I was young. 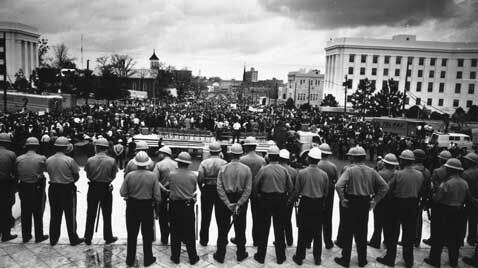 From the first few minutes, where a bomb destroys a church killing 4 little girls, to the attacks on the peaceful marchers on the Edmund Pettus Bridge, I felt every impact as a blow to my own body. I flinched. I hurt. I was distraught. This is the kind of movie that evokes strong feelings and reactions. It is designed to make you a part of the scene and it succeeds. I found it both impossible to watch at times and impossible to look away. That part of our history needs to be witnessed. It needs to be remembered. Today’s situations in Ferguson and Florida and New York are all reminders that we still have so very far to go. That in my lifetime, we have not come far enough. I am disappointed and embarrassed to see that we are not doing better when it comes to getting along as human beings. 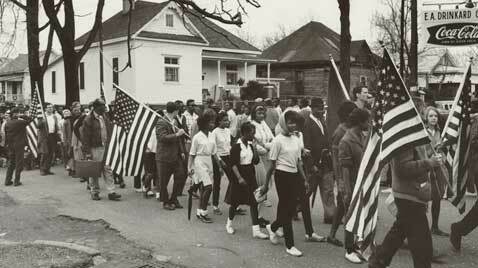 In many respects, we have more divisions than ever – race is just one. I’d like to think that we know better now. I’d like to think that progress has been made. But when I read headlines that could just as easily have come from 1965 as 2015, I feel discouraged. How is it that we still can’t get along with our own kind? We are all part of the human race, people. We all work the same way – we bleed, we breathe, we love, we die – no matter what color we are, no matter what god we worship. And yet…we still make distinctions based on external factors. I left the movie with a lump in my throat. I found it hard to speak. I wanted to tell my son about what I remembered from that time of my life – I was, after all, just a child. But I needed to tell him that I lived through it and I did remember bits and pieces of it. And that it hurt to watch such a painful episode of our history. And that current events showed us we still have far to go. I know I will never think of voting the same again. It is a privilege for everyone. We need to exercise that right every election and remember – for some, it cost them their lives. It’s a right we need to protect and respect. It’s the only way to honor those who had to sacrifice so much to get there. Take the time to see the movie – this is a great day to go. Take the time to feel the powerful emotions. And remember – we have more to do. We can do better. 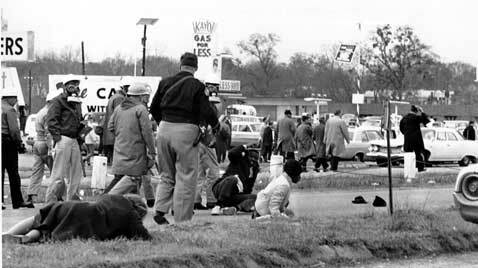 For more information on the March to Selma in 1965, please see here. This entry was posted in General Rambling and tagged Anger, civil rights, Martin Luther King's Birthday, MLK, selma. Bookmark the permalink. The film was very powerful and so is this telling of your experience. 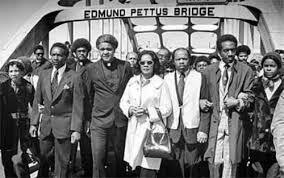 It’s hard to imagine their experience in Selma but the movie brought it pretty close. I want to see this movie, and I want my teens to go with me. I think it’s something everyone needs to see, because you’re right–we have more to do and we can/should do better. Much better. It was good to hear so many schools are making it a point to see it it does a good job of being historically accurate. I haven;t seen it and I too dislike the type of violence you describe but it seems important to see it. So I will.